Are you an entrepreneur, marching to progress? Everyone has seen the famous scientific drawing, showing the compressed evolution of 25 million years. 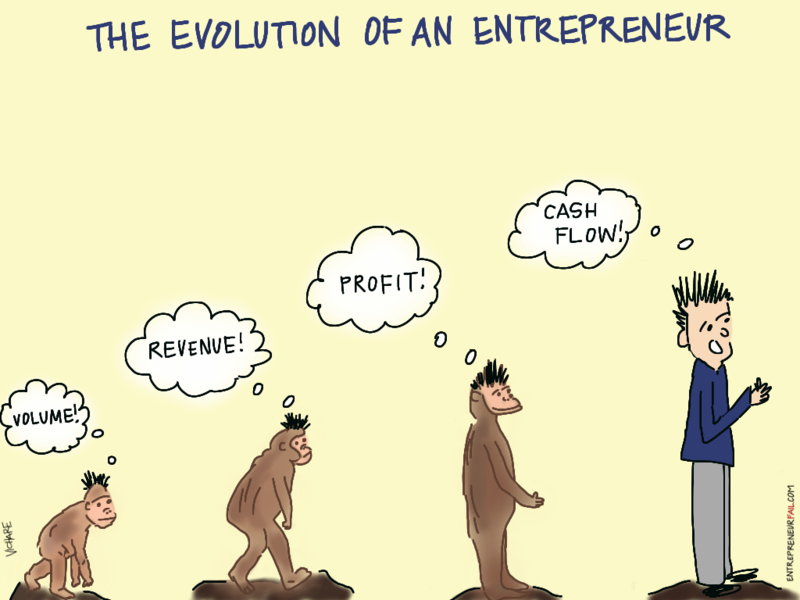 Entrepreneurs also go through a mental evolution as they go deeper into their businesses. I got a sale! The first fresh-faced entrepreneurs focus on volumes. Striving to increase the numbers they sell, they would use any tactic to sell more items. Ironically, huge companies (often with large inventory shipments) also capture these metrics, and looking to hit their volume metrics monthly. The next generation of entrepreneurs are seeking revenues. No longer satisfied with just volumes, they know that pricing can make a huge difference to the perceived value of their products and services. They are carefully tweaking their prices and prodding the elasticity. Sure they are aiming for volumes, but the true lever is revenue. Then reality hits! Revenues have been great, but that doesn’t mean they get to keep any of it. Anybody can dole out productat discounted prices or by subsidizing the sales team to hit their sales targets for commissions. However, all aspects of the cost of doing business need to be considered to successfully generate and maintain profits. And now we reach the modern day successful startup and entrepreneur. In this article, Jeff Bezos recently said that "cash flow per share was the most important thing for Amazon, not profit margins”. Free cash flow, matched with the profits, revenues, and volumes sum upto a modern and successful entrepreneur and company. You just have to let evolution get you there. The writing style is very easy to understand and color combination is very attractive. The picture of this site also provides a good explanation about the topic. It also provides many books on the topic of Entrepreneur. This website http://www.mathtyping.com/why-us/ is helpful for the student who clears the point about the Evolution of an Entrepreneur. The actual composing design is extremely clear to see as well as color mixture is extremely appealing. The actual image of the website additionally supplies a great description concerning the subject. Additionally, http://www.typingdocs.com/our-services/ it offers numerous publications upon the main topic of Business owner. This provides more pictures for the explanations of the concept of the business. It gives more detailed about the business in the form of slide and pictures in which gives more detailed about the concept. The background of this site http://www.typingrates.com/the-evolution-of-transcription-work provides more attractions for the readers. Business plan is most important to achieve success in any business. This is really very good article about entrepreneur and business success. This information of evaluation of entrepreneur will helpful for our business world. Here you must check a useful source to know about our best typing services. Thanks for sharing wonderful informative article.